I managed to finish my spring raincoat in the last week of October. Heh. I have the best timing ever. I cannot believe this took me about a month to make. Which, if you read my blog before last year, would know is a ridiculously long time for me. I once made a winter coat in two weeks! It was even harder getting photos now that I leave the house at 7:30 am for work and don’t get back in until 7 pm. It’s dark when I leave and dark when I get home. Also, I SWEAR to you, each time it rained I felt like I was being taunted. Now that the jacket is done, it’s just cold As I said last post, I left my rain coat in Amsterdam back in September. Nothing tells you how much you need a rain coat until you don’t have one! Unfortunately, my DSLR camera is in the shop. So, we’re using my (still very good) point and shoot. But, I was hoping to try out some of the shooting ‘red’ suggestions. The photos below aren’t too bad. But, the red is photographing hot making it hard to see some of the details. On to the jacket! This jacket is a basic parka with interesting details — something I think Burda excels in– when they aren’t making sack dresses. 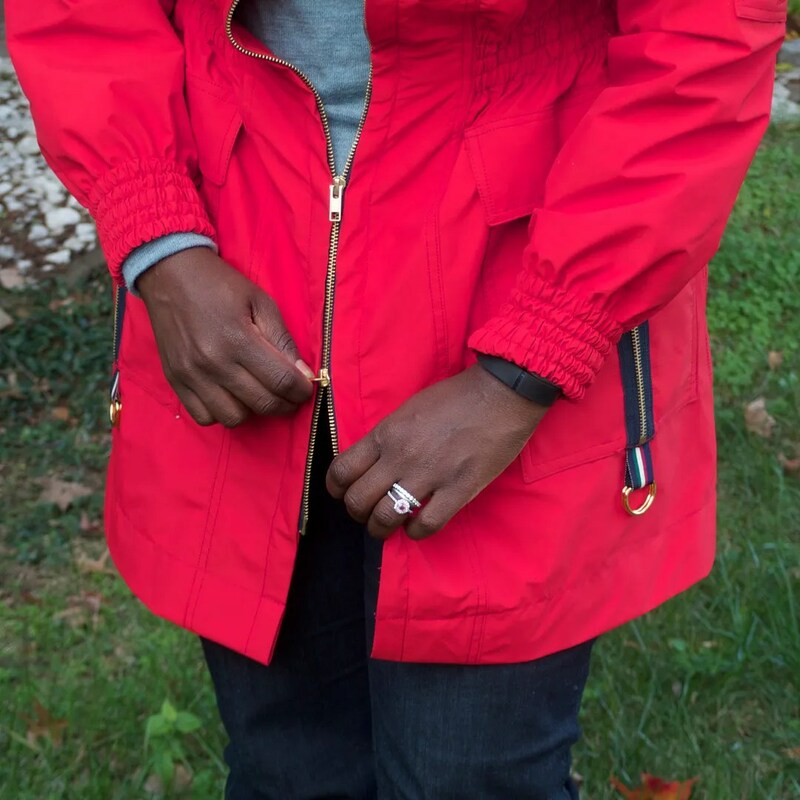 You could easily take about any parka pattern, add some D-rings and zippers and have the same look. But, this is also a good reason to hold on to your older Burdas. There’s a gem in there somewhere. This magazine is well over ten years old. I’m a little late on completing this jacket because after I posted my last update I installed the zipper and tried the jacket on for the first time. Well, when I tried on the jacket, the casing wasn’t balanced (one side higher than the other) AND it wasn’t hitting my waist (too low). So, it looked pretty terrible. I sulked for a day and then decided to spend a few hours taking out six rows of teeny tiny stitching for the casing and redoing the whole shebang. When I re-sewed it, I moved the waist band up about an inch and added the missing fourth row from my first go. I was worried about the waistline casing then looking totally and completely overworked. But, this fabric actually heals pretty remarkably! And, totally waterproof. Redoing the waistband casing was absolutely worth it. The jacket is not super fitted to begin with and I really needed the waist definition. The fabric was from a local warehouse sale and about $2 a yard. I seriously think this jacket was $20 to make or less! I did NOT tape the seams on this jacket. Because of all the topstitching, the seams were fairly water tight. On this pattern, I made a 1.5 inch FBA, took 1/2 inch off the shoulders and made a swayback adjustment. I sewed a 40, grading out to a 46 with a touch more room in the thigh. My friend Liz thinks the jacket is a hair too big for me. But, I think it fits and allows for some boxier clothing underneath (i.e. the wool sweater I ‘m wearing). What else… I wasn’t sure how to do the zipper so that the fabric lips covered up most of the teeth. I didn’t quite trust the Burda instructions and just did it my way. It’s not as closed as I would have liked. But, the blue zipper down the center isn’t as distracting as I thought it would be. And, I do love that the brass peaks through. I also found that NO NEEDLE (microtex, leather, sharp, universal) I had wanted to top stitch through the zipper tape and two layers of my fabric. One of these days, I need take a minute and flesh out my needle stash. Speaking of zips… this two-way zip is 36 inches instead of the 40 asked for in the pattern. And, it was only $2.50 locally from Stadham Sewing in Baltimore (compared to $5 to $11 I saw online). The blue 9 inch zippers on the side were only 75 cents too. And they had this tiny 4 inch zipper for the totally useless sleeve pocket (I hope that yellow wax washes out!). I love that place. I really may go in one day and buy four zippers in every color and length and just stash them. The jacket is unlined and I am fine with that. The fabric is sturdy and doesn’t ravel. Overall, I’m pleased with this jacket. And, I’m really glad I had my heavy Bernina to sew it with. I was looking at the top stitching on Jordan’s jacket and it’s kind of wonky compared to this. You really need a heavier machine when you’re dealing with unruly material. For this jacket, I went with contrast ribbon rather than the recommended leather. While I love the color variation, these ribbons act a fool on the regular. Please see below. If I take the jacket off and let it sort of crumple on the floor, the ribbons comes loose entirely. I’m contemplating stitching them down to keep them in order. The best thing about this project? It might our best photo shoot together. I might not have to fire Jordan as my photograper. Next Post Can You Help Me Find Wigan? The coat looks great. You can buy adhesive velcro dots that would hold those ribbons in place without having to stitching through the ribbon (or the pocket). That’s a really good idea. That way I’d still be able to access the pockets. Thanks, Peter! Your jacket is stunning, great job! I know the unstitching was such a pain but so worth it. Wonderful – the jacket, of course (I am so ‘envious’ of your skills) AND the photography! Thank you for the thorough rundown of the fabric and hardware — and the thoughts about sewing machine and needles for the project. They are great insights for a relatively new sewer…. I think the photos are beautiful, miss. Congrats on finishing your jacket. I really admire your finishing. Your jacket has the deft precision of a high end RTW, I assure you that’s a glowing compliment. Well done! It looks great! I’m glad you finally have the red rain coat of your dreams. Tell us more about your winter coat project? What pattern? Is it a BWTF? I was going to make a Vogue pattern. But, the muslin stage did not go well. So, this morning I’m taking my coffee and my BWTF archives and figuring out which one is next! That could take a while! some of those early to mid ’00s patterns are phenomenal. Do you have a style in mind? 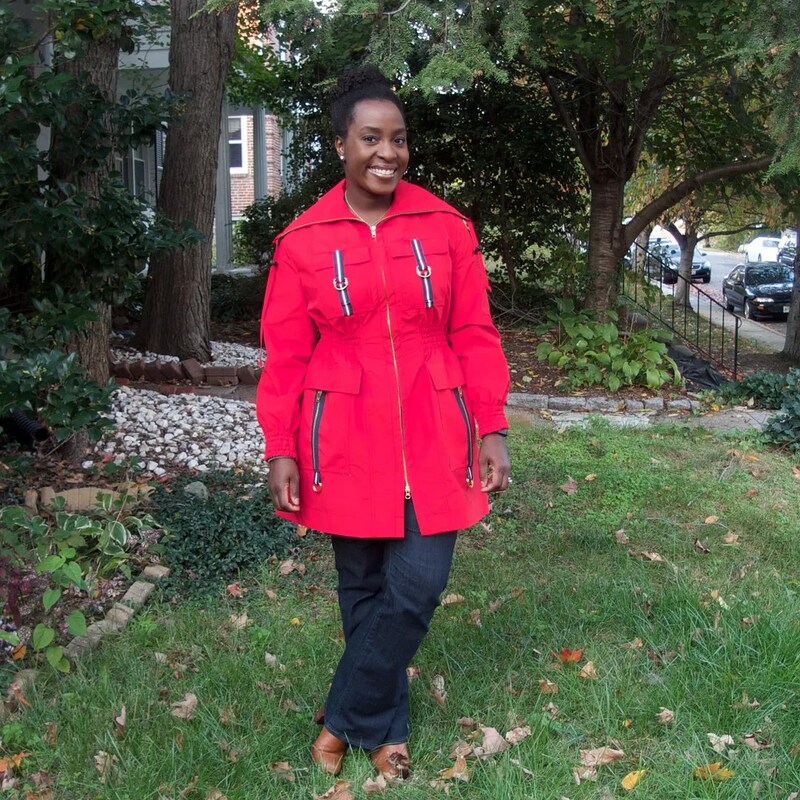 I’m thinking of finally giving that Burda trench that you sewed a go. Shorter though, to reflect the fact I spend most of my time in Southern California. I am clapping. This jacket is fabulous and looks so cosy. Love it! I thought you looked more relaxed in these pictures. Jordan captured your beautiful smile perfectly. Great job on the coat, it’s fantastic! 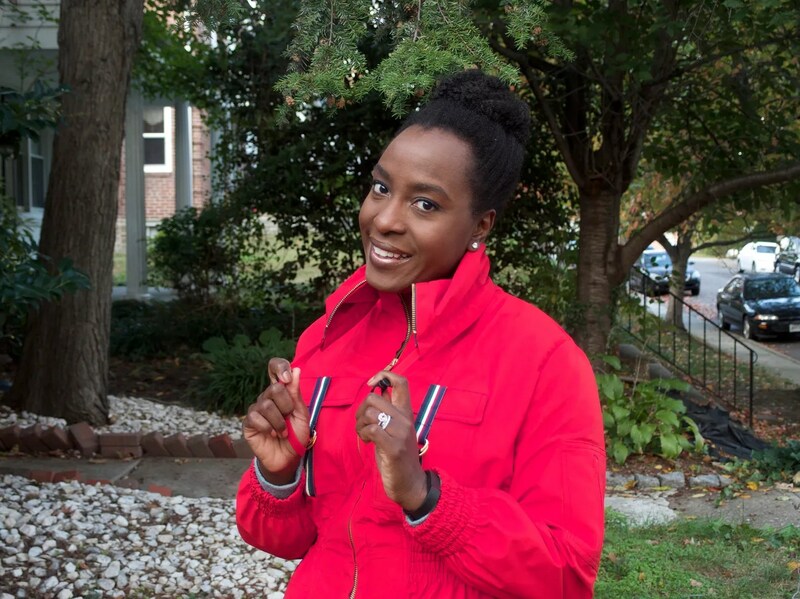 A little envious of your fabric and zipper bargain shopping in your city! Woweeee, that is glorious: it looks so professional! Very cool. Love the colour & the contrast ribbon & hardware. Great job!! Nice work, very cute and your hair is looking wonderful! Definitely inspiring–thank you for keeping this blog! Love that fabric! I must say, I like the idea of the coat being a smidge large so you can put sweaters and what not underneath, it’s a casual raincoat so that’s perfect. I made a less fancy style of this raincoat in the SAME color this summer from a McCall’s pattern (I think?) and have been wearing it all the time in the past couple weeks. 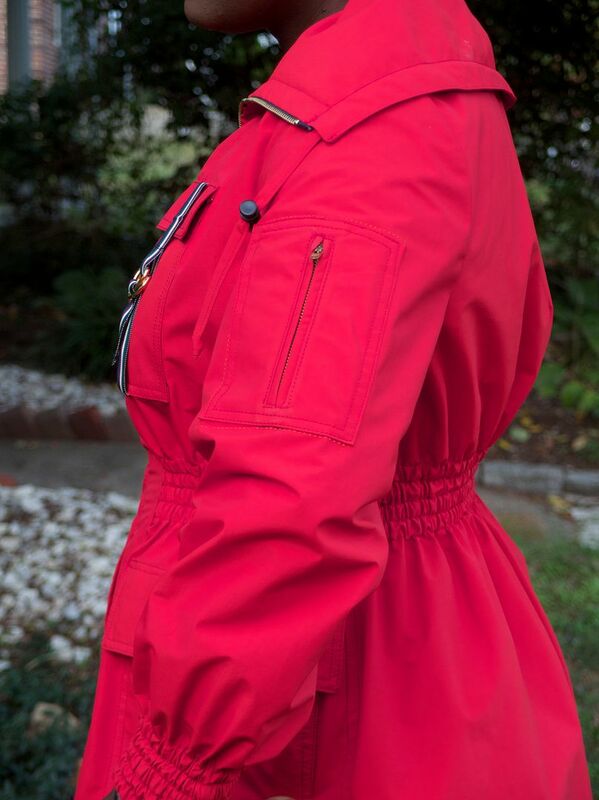 Bring on the rainy days for your new coat! And holy geez, I woulda poked my eyes out before picking out those stitches… but then picked them out, too after all that work. Good hustle!! Linton-Tweed, soft green with a metallic coppery thread through it and it turned out gorgeous. It is fun playing with patterns and styles. I think some people call it doing a Frankenstein on a pattern, taking bits from here and there. All the best and happy winter coat sewing. It’s not too big-it’s a parka! 🙂 I love it, and all the zippers make it so sporty. Lovely work, thanks for sharing. This is fabulous – the details, the color, the size all look really flattering on you. The pictures are very good! You and Jordan are working it! Who cares if you just finished it? In the spring, which is only a few months away, you will have a like-new jacket to wear. I think it is more important to have a life than to sew at the speed of light. However, I would be lying if I didn’t say I missed your more frequently posting – LOL! You won’t care how long it took to make this fab jacket years from now when it’s STILL in rotation in your coat wardrobe. Great job! (And great job on the photos too, Jordan!) About the wax … maybe press it off onto a scrap cloth with an iron? Such a great job! I feel your pain about taking out that stitching. The good thing about not being able to wear it for awhile is that you don’t feel like you’re in a rush, at least. And it will help you look forward to spring! 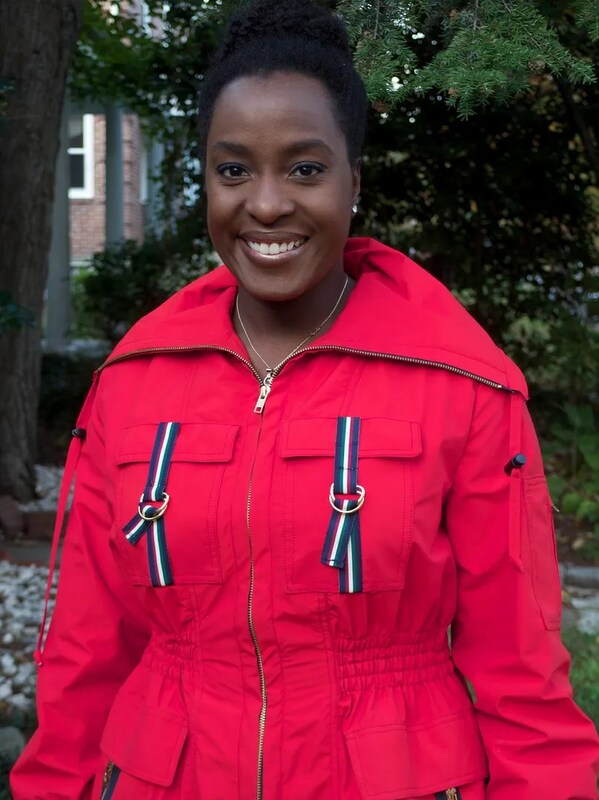 You totally rocked that raincoat like a boss, Miss Celie! A month to make that jacket??? Gosh, it would have taken me a year…minimum…and there’s no way I could ever make a jacket that nice!!! Just for starters…red is my favorite color. The ribbons and zips take it to another level. I love it!!!!!!!!!!!!!!! Awesome job on this jacket, Renee! I love all the details. Burda does make some awesome parka patterns. Their trench coats are loaded with great details too, although I’ve yet to get around to making one. Your parka top stitching was what inspired me to be accurate and keep going! Just beautiful! Jacket and you in every way. You are absolutely right, those old Burdas can really hide some gems. I should have this issue and will make a note of it for spring since this is kind of jacket is sorely missing from my wardrobe.. It’ looks great on you. Glad you were able to finish and wear it. I will make a suggestion on the top stitching over thick fabric. Larger needle. I was test my top stitching on my Burberry fabric on my vintage Viking with heavy thread and it worked beautifully, with a size 18 denim needle. Big enough eye for the heavy thread. I’ve topstitched zipper tape on my leather jacket with a larger needle without an issue and your Bernina should work just as well. I also found that the teflon foot helped or if using a zipper foot, some Scotch Magic tape works well on the foot. Wawak is having a sale on machine needles this month. Thanks! I’ll give that a go next time. I’m planning to make up one of those Burberry cuts for the spring (a more dress up spring coat). You did such a beautiful job!! Then again, you always do!! Beautiful jacket. As we are now in the season of rain, this coat would be very welcome here in Oregon. We don’t need parkas – just something to keep rain and wind out. Looks GREAT and frankly, it is my theory (totally unproven, mind you) that if you have a good, tight waterproof shell, then you can layer on all sorts of warm stuff underneath and it’s just as good as a winter coat. You might be right. I insisted on wearing this out last night over a wool sweater. I wasn’t cold! My friends had on winter coats. So, I do think there’s something to be said for cutting the wind and blocking the rain! 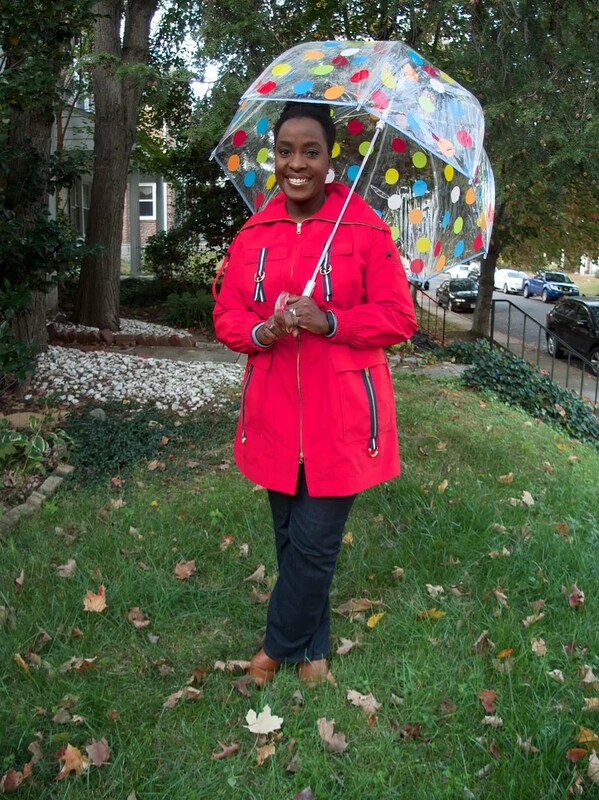 What a great raincoat Renee! I adore the color and your choice of contrasting details! I bet you’ll proudly wear this one for years to come! Fabulous raincoat! Do you mind me asking which warehouse you got the fabric at? I live in Silver Spring but I’m usually up in Baltimore every week or so. I am having serious coat envy, and I adore the little zip pocket! Love it!!! I also found another thing about help photographing red, though it’s about loss of detail rather than having the shade come out weird, but it might still be useful to you– http://www.pentaxforums.com/forums/38-photographic-technique/276739-what-about-red.html I found post 8 particularly helpful. BTW, do you have Lightroom or anything similar for editing photographs? I wouldn’t mind playing around with a few of your photos, if you want. What a great raincoat! I love all the details and the cheerful red color. I’m in awe Renee, your jacket is jaw dropping gorgeous with all the details. A month is not long in my eyes for a jacket like this. I really think it’s fast when you sew only in evenings or weekends (you do work long hours). GREAT job. Great looking raincoat! I love all the design details! 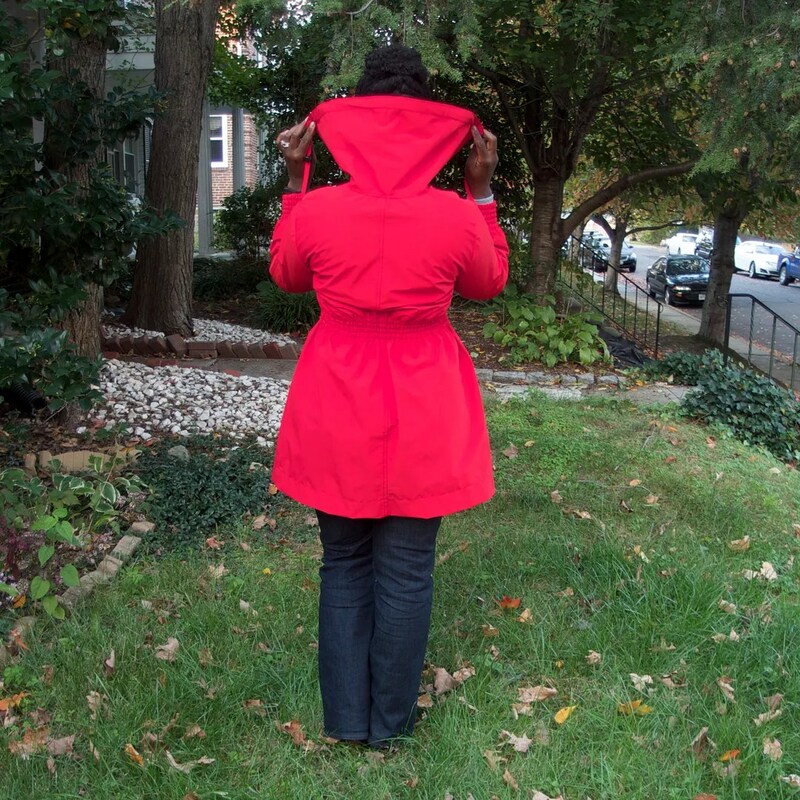 The color of your new raincoat is gorgeous on you! The details are all perfection. I thank you for sharing your bumps and lovely creations. And the “photographer” is a keeper, imho. Better late than never! And what a great job you did. Love it. You did a phenomenal job on that jacket!! And it’s not technically late, it’s early! 😉 Can’t wait to see your next coat project, even though I would be “coated” out by now. Ha! Great jacket. I’m so impressed. I’ve been following your progress. I think it’s a perfect fit and allows for layering underneath. Can’t wait to see what you come up with next. Fabulous! Don’t flog yourself too much about the timing. I’m the queen of out-of-season completion, and it doesn’t matter at all, you just get a nice present for the next season. And think of it this way: if this pattern still looked good to you after 10 years, it’s going to keep on being fabulous way beyond next Spring. Although I totally agree that a good wind/water resistant parka over a wool sweater should take you comfortably into.. February :-). So wear it now and bring a little cheer into the outside world! Congratulations. Wow! You did such an amazing job on your coat!!! I love it! And your patience for ripping out all of that waist…yikers! I can’t believe your fabric deals. I think I’d like to try my hand at a winter coat next year. I should probably start now. Haha! 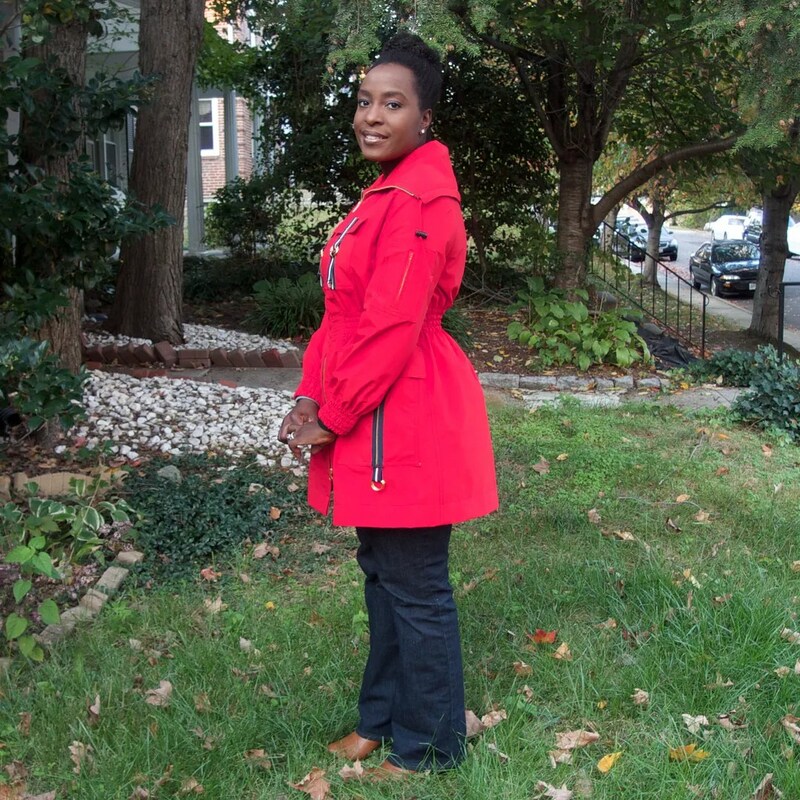 Renee, the coat is lovely. Let’s hope it doesn’t turn cold too quickly and you can wear it long into the fall. I never know what to do with older patterns – I see something I like but then get indecisive about whether it looks “classic” or “dated” and then give up. But you look very modern in your new coat, I think it and you look fantastic. This is a beautiful jacket. Your updo looks really nice too, and perfect to frame your face with the dramatic collar. The waist shaping is perfect, well worth the risk and trouble to unpick and redo. So glad that the fabric underneath sprung back like a champ from that treatment! Absolutely beautiful jacket! I still have this issue of Burda and Ii love several designs from it. Congratulations. Wow, this looks great! All the details really take it to the next level! The fit looks good to me, too. I like to have room to layer beneath my rain jacket, too, and it looks like you have a perfect amount of ease. Beautiful job! I love the color and all the details. And I just have to say, that last picture of you is just a stunning portrait! Your photographer is a keeper!